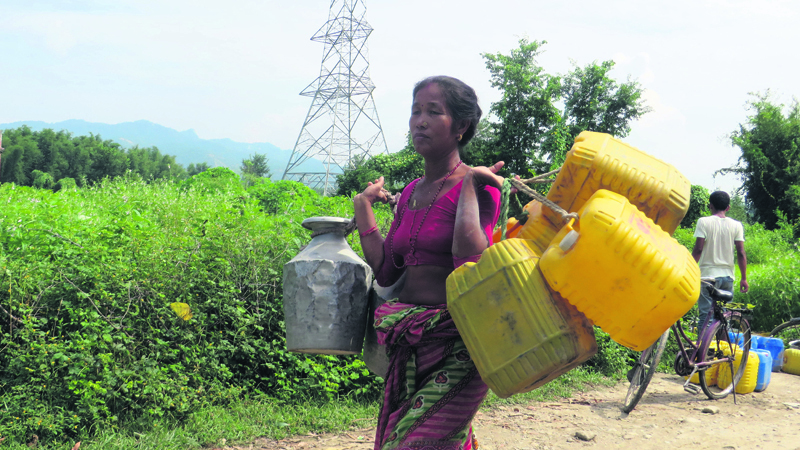 A woman with empty vessels on her way to fetch water in Chandrodayapur in Siraha last week. SIRAHA, Feb 20: Located on the east-west highway near Lahan, Lalpur village is famous for vegetable farming. When the village was merged into Golbajar municipality a few months ago, the villagers were elated, hoping to receive more services to boost their businesses. However, unlike what they had thought, they are now faced with the serious problem of water shortage. Let alone water for irrigation, the locals do not have adequate water even for drinking. The water crisis has bothered everyone in Golbajar now, thanks to the fast drying water sources. “The rivers are drying up. We don't get water through boring or in well. In the last few years, water has become very scarce here,” said a local Jhaman Lal Yadav. “Earlier, there would be rainfall on time. The wells and ponds would always remain full of water. Now, it's no more so,” he added. The biggest reason behind the crisis of water in Madhes is the deforestation of Chure. In the last few years, hundreds of hectares of forest land have been encroached upon. Timber smuggling and river excavation for sand and stones have been going on unabated. “The government turned a blind eye to the situation while the locals, too, could not do anything,” said Yadav, adding that even after Chure was declared a protected area, deforestation in the region continued secretly. “When you destroy nature so mercilessly, what would you expect? It was bound to happen and the reason is the massive deforestation here,” he stated. In Lalpur, some 300 households depend on a single well for drinking water. Even that well, which belongs to Madhav Thapaliya, is now showing no good signs. The water level in the well has gone down. “In fact, there were several other wells here earlier. But as they gradually dried up, people started coming to this well for water. But now, it seems this well, too, can't provide water for long,” Thapaliya said. During the night, the water level in the well rises a bit. A long queue for water in the morning is an everyday story. “Due to over use, this well is drying up, too,” he said. Yadav meanwhile stated that the village does not receive rainfall on time these days while there is no artificial irrigation facility in the village, either. “Earlier, we could predict a rainfall by looking at the sky and carry out agricultural activities accordingly. But time has changed now; nothing is predictable. On top of that, the rivers and wells are drying up,” he said. Yadav remarked that the loss of greenery around has had a grave impact on the entire region's environment. Many hills which were lustrous green in the past look barren now. The roadsides, too, have been deforested. “All this happened before our eyes,” said Yadav. 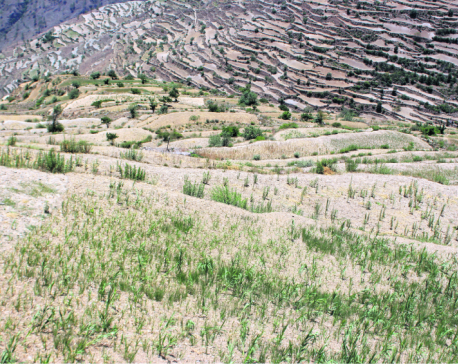 Locals say that the incredible loss of greenery has made the whole Tarai barren. “Our eyes get filled with tear when we see the ruthless treatment of Chure and the rivers. Many, however, have made money by destroying these natural resources,” Yadav remarked. The Lahan branch office of the Groundwater Resources Development Board reveals that most of the hand-pumps of 40 VDCs and three municipalities in Udayapur of have dried up. Udayapur is the last district touched by the Chure range. 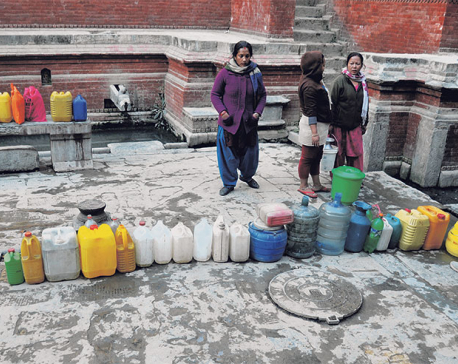 Several hand-pumps in Beltar, Basaha, Tatari, Fattepur, Triyuga and Bhalayadada, among other villages, have dried up. According to the office, 40 percent of households are coping with acute water scarcity. “We are forced to consume water from canals after our hand-pumps dried up. The water is not very clean,” said Lok Bahadur Khapangi of Bhalayadada village. “We dig up wells, but the water level is too low. It seems there is no water beneath the ground. That leaves with only one choice - the canal water,” he added. In the last few years, resources from Chure were openly supplied to India, the locals say. Following media reports on the uncontrolled exploitation of Chure resources, the government put a ban on Chure extractions. However, now, citing the need for materials for reconstruction in the aftermath of the earthquake, the government is considering lifting the ban. This has been widely criticized from all quarters. Forest and water resources expert Dinesh Kumar Yadav urges the government to be sensitive towards the Chure issue, saying the destruction of nature could be fatal. “Tarai is the country's food source. Huge communities live here. Chure conservation is not a choice,” he said.